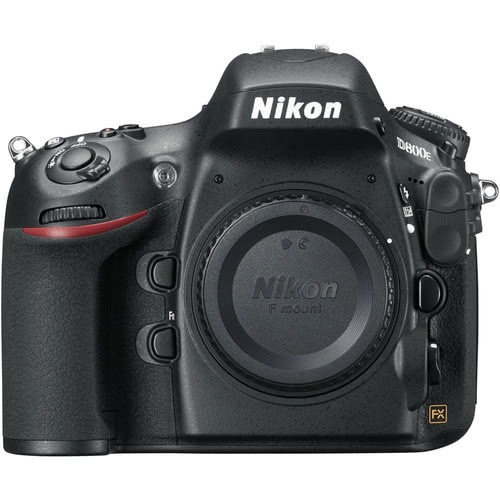 The Nikon D800E Digital SLR Camera boasts all the same specs as the D800 with the exception of one key feature: the D800E lacks an optical low-pass (anti-aliasing) filter. Under normal shooting circumstances, the optical low-pass filter prevents the instance of moire patterns from showing up in your images of tight-patterned objects, such as fabrics. The benefit of removing these anti-aliasing properties for the D800E is maximum sharpness for RAW files, optimized for landscape or simply extreme detail-style shooting. The D800E sports a 3.2” LCD screen, 170º viewing angle, 100% frame coverage, and an EXPEED3 image processor. The high pixel count, FX (full) format sensor produces exceptionally sharp, clean and well-saturated images. The D800E's Live View function is useful when shooting in a studio setting, especially when access to an external monitor is not available. The large MP count produces files up to 7360 x 4912, which is great for print work, commercial assignments, and portraits. The D800E captures images and video in both FX and DX format, giving extra versatility to how you use the sensor for your particular shooting need - DX mode for photography gives your lens a little extra reach while DX mode for video uses an image area similar to 35mm movie film. You also have the option of shooting time lapse photography and save it as a movie file all in-camera. Take advantage of Nikon's native Creative Lighting System by firing off-camera flashes with your built-in flash and controlling external flash power directly from the menu. This camera is ideal for landscape, wildlife (not super fast-moving), specialized commercial work, macro, time lapse, and videography. We make every attempt to have a fully charged battery for you but we can’t guarantee it 100%. If you need a fully charged battery, please request it via the order notes. Note, also, that this camera lacks an optical low pass filter (details in the description below).